In my first blog I stated I would cover the ‘state of the profession’ but we’re all meant to learn from each other, right? One of the best ways to learn is by making mistakes, right? We all make mistakes, right? Right. Well, I made a big one. Take yourself back, Thursday 7th December at 3:53pm – what were you doing? 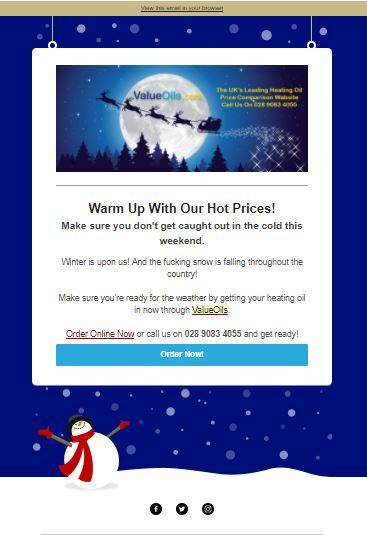 I was working for VO, an independent online heating oil company, a fairly large one with a mailing list in the tens of thousands in Northern Ireland alone. Doing weekly mailshots to NI & UK is part of my remit. So, twice a week I’ll send out an email to hundreds of thousands of people. Best emails you’ll never want to read. Apart from the one I sent on Thursday to our entire NI database. Send it to colleagues & one outsider to make sure my grammar is absolutely on point – people love a grammar error. Well on this occasion, with snow being forecast, I wrote ‘the snow is falling throughout the country’. Apparently, removing the ‘the’ before the word ‘snow’ was more applicable. You may be able to see where this is going. In jest, I put F-ing, in front of the word ‘snow’, screenshotted it and sent it back asking if I’d fixed it. We use Mailchimp, I dare say there is no person dumb enough to hit send with a curse word still remaining, cause a normal human deletes it immediately after, right? Nope. In my defence, we were busy, the phone rang and I took an order so it slipped to the back of my mind. If you’ve heard a worse excuse than that, let me know. My boss asked if I had hit send on the email because it had gotten busy, I said no and hurriedly sent it. See that feeling you have right now, that one where you’re thinking ‘wow, what an idiot’. Multiply it by 10, then square it, put it in a cannon and shoot it into the sky. That was about half of my stress level. Understandably, I’d just ruined my career, the company and my life. Donald Trump was about to start Tweeting about me in 5 minutes and I had just become the reason for a hard border on the island of Ireland. I remembered from a lecture on crisis management that it is vital to get out in front, quickly. So, once I stated my mistake an apology email was sent, it was suggested that we go with ‘hacked’ and blamed it on a prankster. This was probably our only mistake. Cue a few emails and phone calls asking if personal information was stolen but alas, it was not. Just little ol’ me, being a very silly boy. But, if in doubt blame the Russians eh? It turned out that the response to the email was ridiculously positive, especially on social media. I monitored social media long into the night and I still am as I write this, responding to whoever mentions our name. Decided that the best way to deal with this, was with humour. And it worked, for the second time in my life people found me funny! The first being my birth. We got 3 rt’s on Twitter for our apology, we’re an oil company, that probably matches our grand total. But I tried to use GIFs so I could use a bit of humour and not type because I no longer trusted my hands. Luckily, everyone loved it. If you go and look on social media you’ll see that I blamed a student on his second last day being a menace, a statement that I wasn’t sure was entirely false. If I’m being honest, [VO’s] new sweary approach to direct marketing almost makes me want to switch back to oil. In terms of followers, the people who retweeted our/my error had a collective 14-15 thousand followers collectively, which is people we wouldn’t have reached. The email itself had a much higher open rate due to the apology email piquing interest. And we got a host of orders in the immediate aftermath. Although the snow may have played a role, but it was a lot more than we had gotten all day. But I had work the next morning. I usually start at 12, but I aimed to be in for 9 as it wouldn’t be fair for anyone else to take the flak, but due to heavy snowfall and working in Mallusk, I made it in by 10:30. I spent most of the day dealing with complaints via email and phone call, those who were understandably offended by the profanity were largely receptive and accept-ive of the genuine apology after they’d given me a stern talking to, if any of you are somehow reading this, I’m still sorry!! A lot of people found it hilarious and thought that it was a deliberate marketing ploy, fake it till you make it! It somehow worked an absolute treat and my one take away is that stepping away from the norm and taking risks can pay off. If this was deliberate I’d probably have the biggest head right now and be telling you how great I am. But, no, I still feel like an idiot. A lucky one. Hi potential future employers, I’ve learned, promise! PROOFREAD BEFORE YOU SEND AND NEVER, EVER SWEAR EVEN IF YOU DON’T INTEND TO SEND IT. Don’t bury your head in the sand and always tackle the issue head on, especially if it was your fault. I hope you enjoyed reading this story more than I did living it. Even though this is a mistake that I would much prefer to bury and pretend didn’t happen, I like to own up to my own mistakes no matter the consequences, so go on, call me an idiot, I deserve it!